Anyone can rattle off a dozen advantages of shooting digital over film, and some people can even name a few advantages of film over digital. Recently I developed my first roll of film in my basement. Yep, I ordered the chemicals, developing tank and reels, and went to town. Here's one of the mistakes I made, and you can hopefully learn from it. 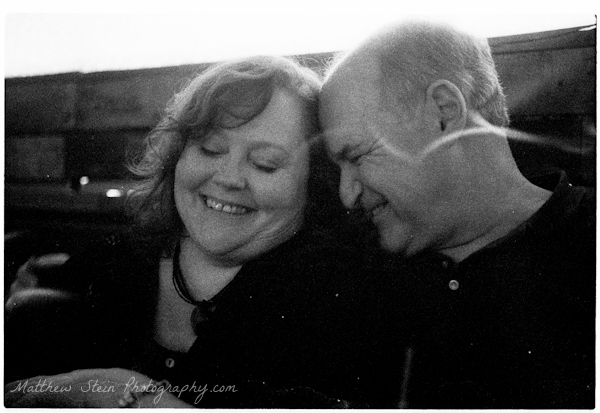 Ken and Laura, with a crease in the film. You see the light curves through Ken's head? That's a crease in the film. When I was loading the film onto the reels, I bent it just a little bit, and the emulsion got screwed up. Amateur mistake. It's not easy to load the film onto those reels. First of all, it's dark. (duh) Second, you want to avoid touching the flat part of the film, so you have to grip it by the edges. You have to gently wind it onto the reels so that the chemicals are able to wash the whole film, otherwise you can get chemical clouding. Practice, practice, practice. Take some film that's already been used and load it onto the reels. Look and see how it all works at first, then try a few times in the dark. Calculate your developing times in advance. Each step of the process has a specific duration. You should know exactly how long each step takes, from development, to stop, to fix and wash. Prepare all your chemicals before starting. Make sure the chemicals are mixed, at the right temperature, and in proper containers so they can be easily used. Have a clean, dust-free, prepared place to hang your negatives to dry. You don't want to risk getting dryer lint or stray cat hair on your shiny new negatives. They need several hours to dry after development before they are less susceptible to picking up dust. Don't have your maiden voyage be on a roll that's critical. No one's perfect, and you don't want to risk making a mistake on something that's too important. Now I have to decide if I want to go into Lightroom and try to fix this crease. It's a lovely picture of my half brother Ken, and his girlfriend Laura. Have you developed film before? What mistakes did you learn from you wish someone had taught you?